Discard swab wrapping. (suggest blowing off with bulb blower to remove any fibers that may have shed in transport) Apply cleaning liquid evenly across edge, taking precaution not to oversaturate the swab. 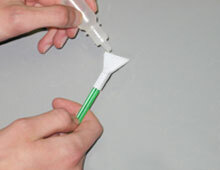 Insert swab width wise to the width of the sensor. Rotate once inside chamber. 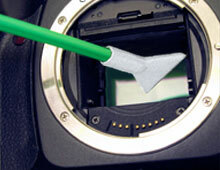 Contact sensor so that swab width is edge to edge of the height of sensor. 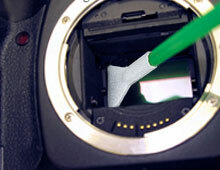 Wipe (gently, firmly) across width of sensor, edge to edge. Lift off sensor, rotate swab width to width of sensor and remove. 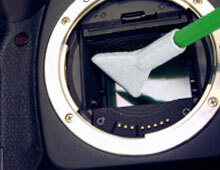 Brush the sensor surface with Arctic Butterfly®, Sensor Brush™ or use VisbleDust hurricane blower ro remove any loose contaminants. 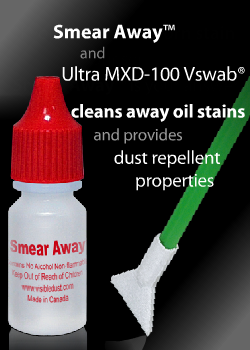 Add 2 to 4 drops of VDust Plus™, Sensor Clean™ or Smear Away™ to edge of swab head. 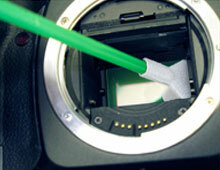 Please visit our Wet Cleaning Guide for a more indepth breakdown of the VisibleDust cleaning solutions.